Shrinking chocolate bars and loaves of bread are leaving U.K. consumers dealing with stealth price rises, according to the Office of National Statistics. Between September 2015 and June 2017, 206 products in the U.K. shrank in size and 79 increased, according to ONS research published Monday. Prices tended to remain unchanged as the sizes changed, “consistent with the idea that some products are undergoing “shrinkflation,” the ONS said. 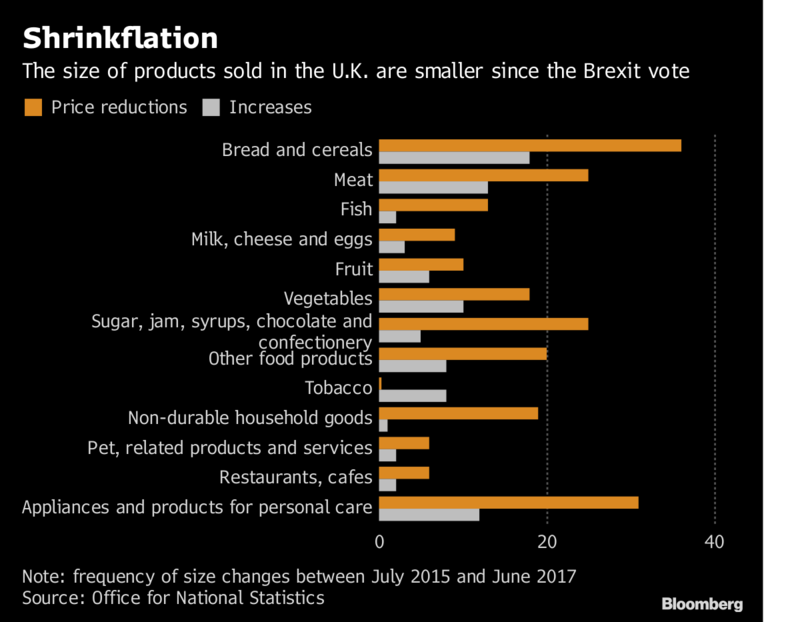 The idea of shrinkflation has been gaining traction in the U.K. as companies facing higher costs look for ways to avoid overt price hikes amid a squeeze on incomes. One of the most prominent examples came following the Brexit vote in 2016, when the drop in the pound led Mondelez International Inc. to reduce the weight of some of its Toblerone chocolate bars, even expanding the gaps between the characteristic triangular segments. The bars subsequently reverted to their original shape amid an outcry from consumers. The ONS research confirmed that chocolate bars are a fertile ground for shrinkflation, with the category that includes the treat seeing 25 products shrinking against just five that grew. The category with the most size changes in the period was bread and cereal, with 36 reductions and 18 increases, the ONS said. “Every day staples such as bread and cereal are most likely to have seen reductions in size, while consumers may also find some chocolate products to be smaller now than they once were,” said Mike Hardie, head of inflation at the ONS.